Alexander (Alex) Williams, a Drexel University iSchool graduate student, is serving a six-month internship with Falvey Memorial Library’s Academic Integration and Information and Research Assistance teams. “We are excited to welcome Alexander back to the Library while he is pursuing his master’s degree [in Library and Information Science] at Drexel University. His master’s degree in English from Villanova [University] makes him a welcome addition to the library staff,” says Jutta Seibert, team leader – Academic Integration. 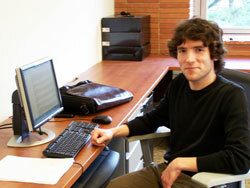 Alex is focusing on information services although he is also interested in competitive intelligence. He expects to graduate from Drexel in 2013. Alex, a native of Rhode Island, earned a master’s degree in English literature from Villanova in 2011. While attending Villanova, Alex worked in Access Services for Phylis Wright, manager of access desk services, and Domenick Liberato, stacks manager. Alex earned his bachelor’s degree in English literature and religious studies from Stonehill College, Easton, Mass. While a student at Stonehill, Alex worked as a circulation aide in the library, an early indication of his future interests.